In verse, one of the most important parts of the work is its rhythm, the pattern of sounds and syllables and the way they “flow” together. Aesthetically, we perceive a poetic or musical utterance that is out of rhythm as dissonant, like a dancer tripping over his own feet. If you have any ear for music at all, you’ve probably noticed this. Think of when somebody you know tries to fit a bunch of words into the pattern of a familiar song, but he gets them all wrong. The line doesn’t scan, and it sounds awful. This is one expression of the idea of meter. Now, if you remember English classes in high school, you probably recall those endless lessons about classical meter. You know, iambic pentameter, and…nobody older than sixteen can ever name any of the others. I know I can’t without looking them up. But meter isn’t just important for reading Shakespeare and pleasing English teachers. (Personally, I didn’t care for either of those activities.) It’s actually an integral part of language as a whole, and verse in particular. Now, I’m not going into a long digression about the kinds of meter and all that. I just don’t want to, and it doesn’t really help the discussion. Instead, this post will focus on the generalities of meter and how they relate to a language and a culture. That, I believe, is more enlightening than trying to memorize the difference between an iamb and a trochee or whatever. Meter is the rhythm of language, as I said, and each language has its own, even before you start talking about poetry. Some languages, for instance, have a fixed stress position; according to WALS Chapter 14, about 56% are like this. Of these, most have a fixed stress on the penultimate (second to last) or initial syllable of a word, while the final syllable is a fairly distant 3rd place. Now, if a language requires stress to be in a certain place, then that’s something verse has to work around. It forces a kind of “template” on meter. Initial and penultimate stress, for instance, both imply a stressed-unstressed (trochaic) pattern, while final stress gives the opposite (iambic) pattern. That doesn’t always have to be true, of course, but there’s an obvious pressure to do things that way. A lot of other languages, however, are like English. Their stress can move around. In English, for example, affixes can and do affect stress: compare nation (stress on first syllable) to nationality (stress on the third from the last). In such languages, there’s no obvious “default” meter. Now, there can be other factors determining which rhythms are acceptable, but any rules are more along the lines of convention than law. Thus, English has a rich history of different meter types, and these have come to be associated with different authors, styles, and even moods. If you’re making your own language (and culture), then this knowledge gives you an edge on pursuing more creative aspects of your work. Say you’ve already decided that your conlang has a fixed penultimate stress. Well, the speakers will naturally gravitate towards poetic meters which go well with that. Meter carries over from poetry into song, too. After all, they both come from the same foundations. In Western music, for example, 4/4 time is common, and the usual pattern is a heavier “stress” on the first and third beats of a measure. If you consider each beat to be a syllable (or mora, if your language is doing that), then that maps quite naturally onto a trochaic rhythm. Put the emphasis on beats two and four instead, and you’ve got something iambic. There are a few easy ways you can use that to your advantage. One, you can assume that the off beats are unstressed syllables, making each measure two metrical feet, if we’re using 4/4 time. (Something like, say, 6/4 would be different, but the math should be easy.) Another option is to take one beat as the primary stress, turning each measure into a single foot. Once you get outside the Western musical tradition, this pattern tends to break down, but not the basic idea of it. Beats match up with stresses, pitch changes, or whatever a language uses. That’s not even a cultural thing, really. It’s pretty much hardwired into our brains. The cultural aspect is all in deciding what patterns we want to hear. Writing verse is hard. I can’t do it—that’s why I’m writing about it instead. Setting it to music is even more difficult. But the basics aren’t impossible to understand. Verse, whether in poetry or song, comes down to following (and knowing when not to follow) simple patterns in language. Meter is one of those patterns, an imprint upon our poetry, a kind of paint-by-numbers outline. If you’ve ever tapped your foot to a song or been entranced by a chant or speech, you know how powerful those patterns can be. Pandoc is a great tool, as I’ve already stated, but it can’t do everything. And some of the things it dies aren’t exactly what you’d want when creating a book. This is especially true when working on a print-ready PDF, as I’ve been doing. Fortunately, there is a solution. Unfortunately, it’s not a pretty one. The way Pandoc works internally—I’m simplifying a lot here, so bear with me—is by turning your input document (Markdown, in my case) into an AST, then building your output from that. That’s basically the same thing a compiler does, so you could think of Pandoc as something like a Markdown compiler that can output PDF, EPUB, HTML, or whatever. But Pandoc is written in Haskell. Haskell, if you’re not familiar with programming languages, is the tenth circle Dante didn’t tell you about. It’s awful, if you’ve ever written code in any other language, because it’s designed around a philosophy that doesn’t really match anything else in the programming world. (Seriously, go look up “monads” if you’re bored.) For us mere mortals, it’s sheer torture trying to understand a Haskell program, much less write one. And Pandoc’s default language for writing filters, alas, is this monstrosity. If I had to do that, I’d have given up months ago. But I’m in luck, because Pandoc’s developer recognizes that we’re not all masochists, and he gave us the option to write filters in Python instead. Now that I can use. It’s not pretty. It’s not nice. But it gets the job done, and it does so without needing to install extra libraries or anything like that. So, I’ve written a few filters that take care of some of the drudgery of converting Markdown into a decent-looking PDF. You can find them in this Gist if you want to see the gory details, and I’ll describe each of them below. In Pandoc’s version of Markdown, you can get a horizontal rule (the HTML hr element) by making a line containing only asterisks with spaces between them: * * * is what I use these days. It’s simple enough, and you can use CSS to make it not appear as an actual line across the page, but as a nice vertical blank space that serves as a scene break. It even carries over into MOBI format when you use Kindlegen. But it doesn’t work for PDFs. Well, it does, but there’s an even better way. Since I’m using Memoir, I get what are called “fancy” breaks. In print, they’re nothing more than a centered set of asterisks, stars, or any other icon you’d like to use. Those can be a bit tacky if they show up after every seen, though, so there’s another option that only shows the “fancy” breaks when they’d be at the end of a page, but instead puts in a “plain” blank otherwise. In Memoir, this is the \pfbreak command, and it’s smart enough to choose the right style every time. So all the fancybreak.py filter does is swap out Pandoc’s HorizontalRule AST element, replacing it with the raw LaTeX code for Memoir’s “plain fancy break”. Take out the boilerplate, and it’s literally only three lines of code. Simple, even for me. Another difference between print and digital editions of a book comes from the formatting available. E-books are interactive in a way paper can’t be. They can use hyperlinks, and I do exactly that. But it’s impossible to click on a link in a paperback, and blue doesn’t show up in a black and white book, so I need to get rid of the link part. Ideally, I’d like to keep the address, though. The guts of this filter are only 5 lines, and the hardest part was working out exactly what I had to do to get the link address. Pandoc’s API documentation isn’t very helpful in this regard, and it gets even worse in a moment. I like the “raised initial” style for books. With this, the first letter of a chapter is printed bigger than the rest, and the rest of the first word is printed in regular-sized small caps. Other people like “drop caps”, where the initial letter hangs down into the first paragraph. Either way, one LaTeX package, lettrine, takes care of your needs. Using it with Memoir is a matter of importing it and adding a bit of markup at the beginning of each chapter. Using it with Pandoc, on the other hand, takes more work. Since I don’t want to sprinkle LaTeX code all over my source documents, I made these filters to inject that code later in the process. And that was…not fun at all. After a lot of trial and error (going from Haskell to Python and back doesn’t give you a lot of useful diagnostics), I settled on the process I used in these filters. They’re the same thing, by the way. The only real difference is their output. Well, and dropcaps.py has to break up a Quoted element so it doesn’t blow up the opening quotation mark instead of the first letter. Doing that required some trickery. If you’d like to try it for yourself, I suggest drinking heavily. If you don’t drink, well, you’ll want to by the time you’re done. Anyway, after I finished this herculean task, I had a set of filters that would let me use my original source files but produce something much more suited to Memoir and the paperback format. Now I’ve got fancy scene breaks, links that write themselves out when they’re in a PDF, and those wonderfully enormous initial letters starting each chapter. Can I do more? Of course I can. The last two filters don’t take into account “front matter” chapters. For my current novels, that’s not a problem, as I don’t use those. But if you need something with, say, an extended foreword, then you’d need to hack on the scripts to fix that. There’s also nothing at all I can do for the opening pages of the book, the parts that come before the text. Here, the formats are too different even for filters. I’m talking about the title page, copyright page, dedication, and things like that. (These, in fact, are considered front matter, but they’re not part of a chapter, so the last paragraph doesn’t apply.) I still need to maintain two versions of those, and I don’t see any real way around that. Still, what I’ve got so far is good. It was a lot of work, but it’s work I only have to do once. That’s the beauty of programming in a nutshell. It’s automation. Sure, I could have done the editing by hand instead of writing scripts to do it for me, and I probably would have been done sooner, but now I won’t have to do it all over again for Nocturne or any other book I write in the future. To close out this miniseries, I have one more post in mind. This one will look at some of the additional LaTeX packages I used, like the lettrine one I mentioned above. By the time that comes out, maybe I’ll even have another book ready. 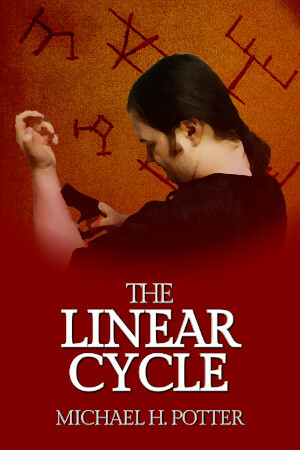 At long last, after months of writing, rewriting, editing, and “beta” testing, the Linear Cycle has begun. 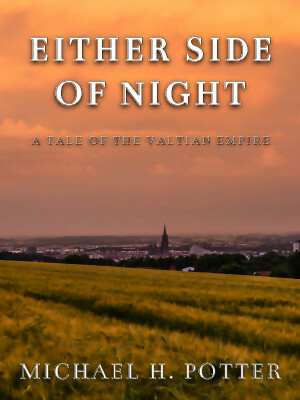 This set of 6 stories (call them novelettes if you wish) tells the tale of the Valtian Empire and its fall to the Touched, a horde of supernaturally animated dead that feeds off magical energies. The story opens with “Either Side of Night”, the tale of Dusk, a boy caught in the midst of this unfolding disaster. This is probably one of the darkest stories I’ve written. It has a horror aspect in the zombie horde (though I specifically avoid both the term “zombie” and the phrase “walking dead”), and a kind of epic feel in later parts. I do focus a lot on the “negative” emotional aspects, probably more than in any of my other works. Pathos, drama, despair…they’re all here, and I don’t shy away from depicting some truly heartbreaking scenes. (Seriously. Reading the ending of the series without crying was actually harder than I thought.) But there’s a lot of hope buried in there, too. Yes, it’s the end of the world as we know it, but that doesn’t mean it’s the end of everything. You can click the link above to get to the main page for the story here on Prose Poetry Code, or you can pick it up on the Kindle store for 99 cents. If you like, you can also get it from Patreon for about the same price; if you keep up your pledge over there, though, you’ll get access to my other works, including future installments of the Linear Cycle. Keep watching for the second part of the series, “The Last Captain”, coming May 22. One of the hardest things about creating a realistic, naturalistic language of your own is capturing some of the ways real-world languages create meaning. Some of those ways are less than obvious, as anyone who’s tried to translate metaphors well knows. And idioms might be the worst of all. Idioms, in essence, are phrases with meanings that are not obvious, that can’t be determined by looking at their constituent parts. They’re figures of speech. They often grow out of slang or colloquialisms, they may be highly dialectal, and many are simply untranslatable. An idiom’s meaning will often be figurative, not literal (though this isn’t always the case), and there can often be significant cultural associations involved. Now, idioms aren’t the same thing as metaphors and similes. Those are comparisons. Equations, if you will. An idiom, on the other hand, is simply a fixed phrase with a specific meaning, one that substitutes for the “real thing”. And they’re also not necessarily euphemisms, because there doesn’t have to be any hiding involved. Everything can be out in the open, but it may be harder to put together, especially if you’re not a native speaker. English, of course, is full of idioms. We talk about jokes or lies as “pulling one’s leg”, for instance, and a sad person might be described as “feeling blue”, a familiar one as “ringing a bell”. Neither of these phrases makes any literal sense, as (unless you have synaesthesia) you can’t really “feel” blue. Some others, like “knock on wood” and “cross my heart” may have grown out of actual practices, but they’ve since become idiomatic. The problem with idioms is that, because they’re so very culture-specific, they’re exceedingly difficult to translate. In some cases, they may even be impossible to render into another language while still preserving some semblance of meaning. Literal, word-by-word translation fails utterly, because of the figurative nature of the idiom; it may be a phrase made up of words, but it’s an indivisible unit. Many languages, especially those closely related, may have idioms with similar meanings, which helps. But a conlang, by definition, doesn’t have that luxury. Again, literal translations won’t work, so what do we do? More artistic conlangs are worse off when they need to translate idioms. When you’re first starting with a new language, the “distill” approach might be your best bet, but as your creation gets more involved, more complex, you’re going to have to come up with something better. Eventually, you may need to start creating your own idioms. Either you want to use them in your conlang, or you’ve come to the conclusion that the best method of translating out of English (or your native tongue) is to swap like for like. Here’s one of the more creative areas of language construction, which naturally means that it’s one of the hardest to generalize. Idioms are figures of speech. If you’re making a conlang that has any sort of culture behind it, then you’ll need to think about what figures into that culture. History, art, religion, science, politics, mythology, and almost anything else can come into play here. For example, a lot of our English idioms derive from medieval or early modern Christian beliefs (“the devil’s in the details”) or culture (“the proof is in the pudding”), but the past few decades have brought an increasing number of modern creations referring to technology (“information superhighway”; fortunately, that one finally died out) or media (“Netflix and chill”). For a conlang, then, idioms require a cultural backdrop. It doesn’t have to be perfect, and you only have to go into as much detail as the work requires, but if you want to make something natural-looking, you might need to do a lot more thinking than you originally anticipated. Borrowing (which you might think is the easiest way to go) doesn’t really work, though you might be able to get away with importing a few English modernisms into a near-future conlang—you could always blame the Internet. Everybody else does. Last time, I talked a little about how I used Pandoc to create a paperback book. Well, since I wrote that, I’ve not only posted the thing, but I have a copy of my own. Seriously. That’s a strange feeling, as I wrote about on Patreon. Anyway, I promised I’d talk about how I did it, so that’s what I’ll do. First off, we’ll look at Memoir, one of the greatest inventions in the history of computer-aided authorship. It’s not perfect, and the documentation is lacking in some respects (the package’s author actively refuses to tell you how to do some things that upset his aesthetic sensibilities), but it’s far superior to anything you’d get out of a word processor. Oh, and it’s like code, too, which is great for logical, left-brain types like me. So, let’s assume you know how to use LaTeX and include classes and all that, because this isn’t a tutorial. Instead, I’ll talk about what I did to beat this beast into shape. First off, we’ve got the class options. Like most LaTeX packages, Memoir is customizable in the extreme. It’s not meant only for books; you can do a journal article with it, or a thesis, or just about anything that could appear in print. So it has to be ready for all those different printing formats. Want to make everything print only on one side of the page? You can do that. Multicolumn output, like in a newspaper? Sure, why not? Besides those, I only need to specify two other options. One is ebook, which sets the page to a nice 6″ x 9″—exactly the same as Amazon’s default paperback size. If you want something else, it can get…nontrivial, but let’s stick to the basics. Oh, and I want american, because I am one; this changes some of the typography rules, though I’ll confess I don’t know which ones. The remainder of the LaTeX “coding” is mostly a series of markup commands, which work a bit like HTML tags. The primary “content” ones are \frontmatter, \mainmatter, and \backmatter, which are common to Memoir and other packages; they tell the system where in the book you are. A preface, for instance, is in the front matter, and you can configure things so it gets its pages numbered in Roman numerals. Pretty much the usual, really, and not Memoir-specific. Changing margins. Amazon is finicky when it comes to these. It actually rejected my original design, because Memoir’s 0.5″ is apparently less than their 0.5″. So I’m using 0.75″ on the left and right for Before I Wake, and I suspect Nocturne will need something even bigger on the inside edge. Top and bottom get 1″ each, which seems comfortable. Adding subtitle support. I don’t need this for either of the two novels I mentioned, but I might later on. Pandoc passes the subtitle part of its metadata through to LaTeX, but Memoir doesn’t support it. So I fixed that. Creating a new title page. This was fun, for varying values of “fun”. Mostly, I just needed something functional. Then I had to do it again, to make the “half-title” page that professional books have. Fixed headers and footers. This was mostly just configuration: page numbers in the outer corner of the header, author and title alternately in the middle, and footers left blank. Not too bad. Changing the chapter style. Here’s where I almost gave up. By default, Pandoc tells LaTeX to create numbered chapters. Well, I did that myself. Rather than go back and change that (it would screw up the EPUB creation), I told Memoir to ignore the pre-made numbering completely. This is especially important when I get to Nocturne, because it has a prologue and epilogue. Having it put “Chapter 1: Prologue” would just be stupid. Add blank pages. Now, you might be wondering about this one. Trust me, it’s for a good cause. Memoir is smart enough to add blank pages to make a chapter start on the right side (that openright thing I mentioned earlier), but it won’t do that at the end of the book, or if you go and manually make a title page, like I did. Oh, and if you’re doing a print book, remember that it ends on the left page. The whole thing was almost a hundred lines of code, including the text for, e.g., the copyright and dedication pages. All in all, it took about three or four hours of work, but I really only have to do it once. Next time around, I just tweak a few values here and there, and that’s it. Automation. It’ll eventually take everybody’s job. So that’s enough to get something that looks like a book, but I’m still not done. Next up, you’ll get to see the bane of my existence: Pandoc filters. And then I’ll throw in a little bit about some interesting LaTeX packages I use, because I need Code posts. See you then!